The words we use matter A LOT! They carry far more meaning than their simple definition might imply. I find that, as I work with both clients and clinicians on dismantling internalized weight stigma, many feel overwhelmed and intimated by the linguistics of it all. Learning to speak and process in a non-stigmatizing way is a lot like learning a new language! So I developed a very brief primer to help you on your way. It is certainly not exhaustive but my hope is that making some of these shifts will empower clinicians to feel more confident in providing non-stigmatizing care and help all of us as individuals continue to unravel the thin ideal handed to us by the medical community and popular culture. Overweight: While seemingly innocuous, overweight begs the question, “over what weight?” Who defined this weight or range of weights that all human beings are not supposed to be over? Are we talking about the BMI? I sure hope not because BMI is a mess of a health-screening tool with absolutely no bearing in research. If you want to dive deeper into this topic, check out this quick post, written by the team at Be Nourished. Obesity: Oh how this term hurts my soul. Its very definition assumes disease. Calling someone obese is essentially the same as saying, “your size tells me you are ill.” A large size is considered a medical condition, which implies a negative impact on health. Its Latin roots describe a person “that has eaten itself fat.” Assuming disease and behavior based on appearance is the literal definition of stigma. We have to drop this term like a hot potato. Given how common the terms “overweight” and “obesity” are in our culture, you may be wondering what in the heck you CAN say instead. Higher Weight/Lower Weight: I personally like these terms because they are purely descriptive. It allows you to acknowledge a person’s size in a factual way without bias. It’s akin to describing a person as short or tall. I sometimes also say “middle of the road” when describing someone whose body is closer to the average size of a Western male or female. According to a quick Google search, that’s somewhere around a size 14 or 16 for women’s clothing. I also use the language, “those living in a larger body,” when describing higher weight individuals. **A Note about that Word – “Fat.” Most often, the connotation of the word fat implies an insult or a criticism. Even the well-intended Jennifer Lawrence declared that “it should be illegal to call somebody fat.” For those of us in the body acceptance world, this statement was terribly misguided. Rather than seeing the word fat as “bad,” many in the size acceptance movement are working hard to reclaim it as a description, much like freckled or blue eyes. We don’t want to get rid of the word fat. We want to change the connotation and stigma of it. Given the fact that many people still experience this term as an insult, I’d suggest you use caution when speaking about other people, especially if you are not fat yourself. I do hope this primer on weight inclusive language is helpful for you and perhaps even a resource to share with friends, family, and colleagues. 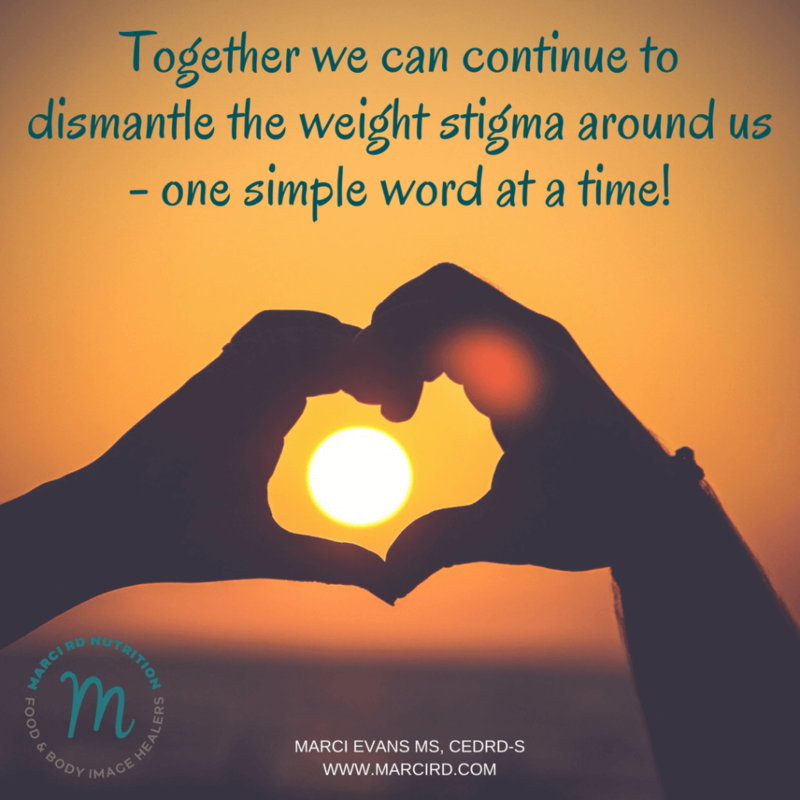 Together we can continue to dismantle the weight stigma around us – one simple word at a time! I’m curious – has shifting your language helped you in your body healing work? Please comment below – I’d love to know! P.S. I learned about this awesome article “What’s In A Word? On Weight Stigma and Terminology” and highly recommend you read it!